Look at my little dressage pony! Doesn’t he look precious (and slightly tortured at the same time :P)! I think so. With everything going on with the saddle I still wanted to keep my bridle because, yes, it really is that nice. Notice how it fits Phoenix like a dream? So I know you all have been asking for pictures of my splurge purchase so here they are…Pictures of my beautiful new Schleese Bridle! Take a look at those reins. They look normal right? Well they are not. They are made of a very cool (and very soft) material which gets sticky when they get wet instead of slippery! If I ever have to show in pouring rain these reins are going to give me a huge edge. One of the things I love so much about it is the crown piece. 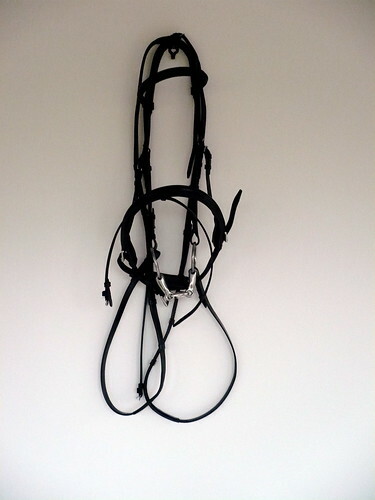 Most bridles have the crown piece and a separate piece for the nose band lying underneath the crown piece. 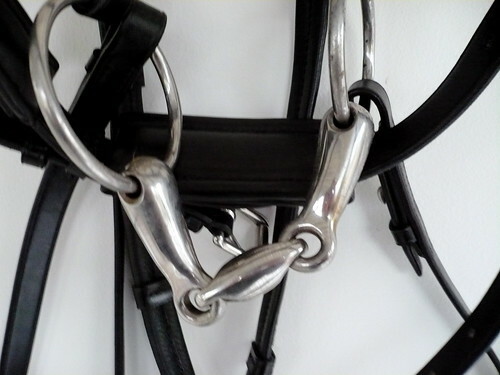 If the bridle is too tight that can cause extra pressure on the poll for your pony. 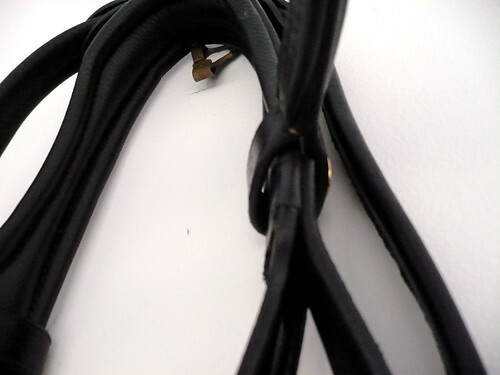 For comfort on the Schleese bridle there is just a single padded piece over the poll. They are also slight cut outs for the ears for maximum horse comfort. It is a little tough to see in the picture above, but it is obvious in the top photo of Phoenix. 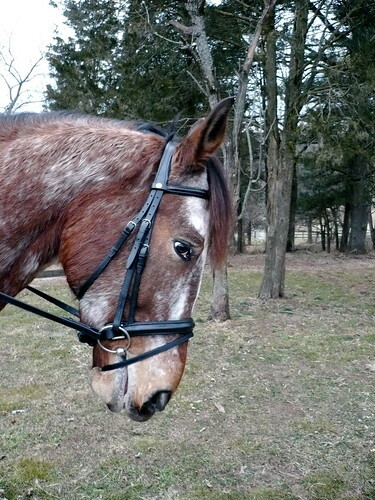 The thing that I am having the hardest time getting used to is the fancy noseband. My poor self is used to just pulling and attaching. This fancy one is designed so the instead of having a buckle dig into the horses chin you have a larger area of pressure and padding. As you can see the whole bridle was designed for total horse comfort. The pad for under the chin is attached in this really cool way with keepers that are totally attached. I cannot tell you the number of times I have been nice and put someone elses fancy bridle away only to stop half way to the tack room crawling on the ground looking for a keeper. I wont have that issue with my new bridle though. I am so excited! 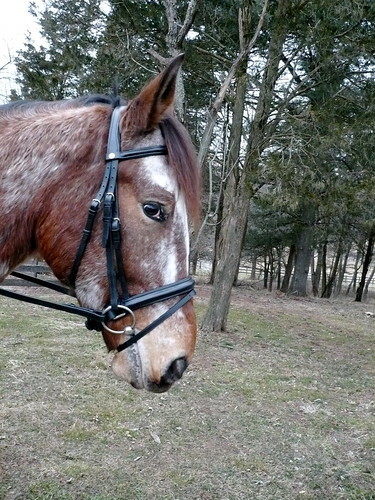 The thing I love most about this bridle is the attention to detail. There are tons of high quality leather bridles out there, I know because I have been shopping for one since last summer! The reason I bought this one (besides the obvious that Jochen Schleese called me a good rider and therefore could have sold me a bucket of dirt in the middle of the ring) is because of the care that was put into creating it. It was literally designed with the horse in mind. And the padding…well…it just feels like heaven! So Phoenix would like to know what you all think. Does he look good in his fancy new headgear? I know this is totally breedist of me, but even with the fancy gear I still think my Appy looks odd in dressage gear! Odd but cute of course. Very cute.